Created on Dec. 27, 2012, 6:10 p.m. by Hevok & updated by Hevok on May 2, 2013, 5:01 p.m.
Telomeres are repeated series of DNA sequences (TTAGGG in mammals) at the very end of chromosomes and become shorter during cell division due to the end replication problem. They protect the ends from deterioration or from fusion with neighboring chromosomes. Short telomeres are associated with various age-related pathological states . 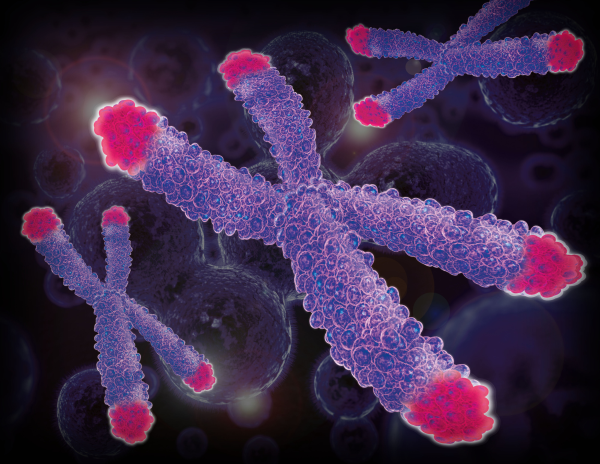 The enzyme Telomerase is able to elongate telomeres, but its expression is shut down during maturation/differentiation in most of the somatic cells of Aging organisms.